Back when I first started this blog I shared a recipe. A bread recipe that’s perfectly divine. Crusty on the outside, soft on the inside. A bread that resembles fresh bakery bread in both texture and taste. Sounds perfect, right? Oh, it is, but one issue. That divine bread goes against much of how we eat today. 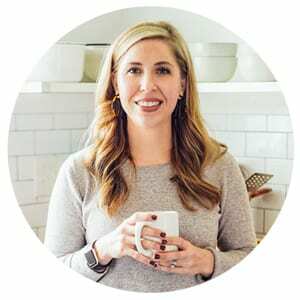 I’ve debated taking down that recipe because it’s both lacking in beauty (you can view the embarrassing post here and be grateful my blogging and photography skills have improved slightly) and wholeness. What could possibly be so wrong about an oh, so perfect bread? First, it’s made with white flour. I know, sinful! Second, it isn’t soaked or sprouted. It’s just one big ol’ loaf of white, crusty fresh-from-the-oven bread. Now, I realize the outcry a white bread recipe may elicit from my real foodie, purist friends. I know, I struggle with the idea of a huge white loaf of delicious bread too, but I’ve learned to embrace this white loaf of pure heaven. Before you hit that exist button, please let me explain. I truly believe real homemade, from scratch food is about bringing family together in the kitchen and the garden and celebrating the time spent preparing food made with basic ingredients. I believe there is a culture we build behind food when we eat in this way. 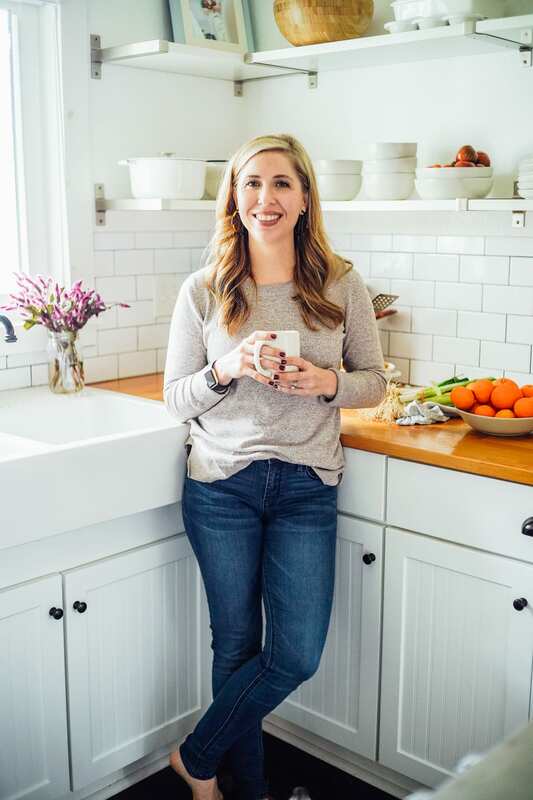 Today, it seems so many of us are so focused on what we shouldn’t be eating, that we lose sight of the goodness we can be preparing in our kitchens and the culture of homemade food we can cultivate with our children. It’s important to eat for nourishment and nutrition, but it’s also important to eat with the idea of not making homemade food into a “good” and “bad” laundry list. Dissecting every last morsel. Homemade food is meant to be prepared with love and celebration. With culture and tradition and the idea of bringing delicious ingredients together to be enjoyed. With that said, this bread is one that cultivates a culture of tradition in my kitchen. 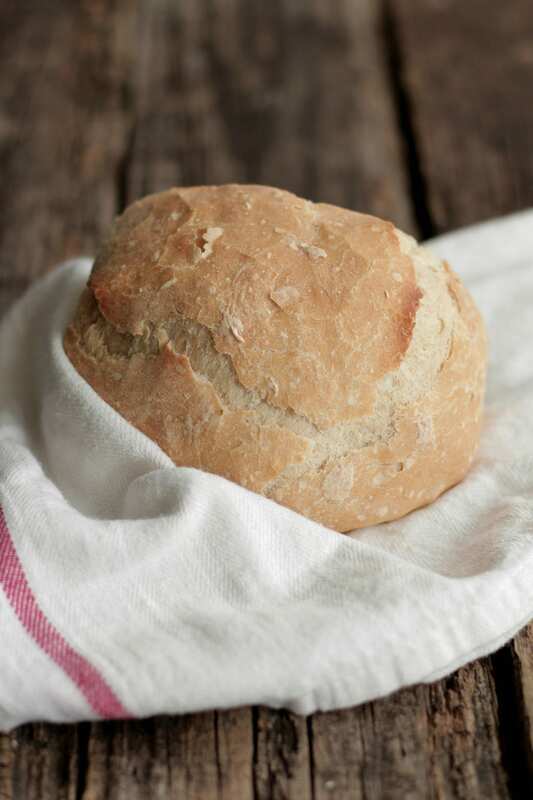 The earthiness of this bread, the time spent preparing it, and the nourishing soups and big salads we enjoy it with will forever be etched in my children’s memories. How every fall the big, well-loved dutch oven is dusted off and the white flour bag is broken open. That my dear readers, is what real, homemade food is meant to be. A joyful memory, a tradition, not based on fear, but instead joy and delight. So, while I truly strive to soak and sprout most of our grains and use whole sources such as whole wheat, there are times a lovely loaf of crusty white bread just must be made, broken at the table, and slathered with fresh butter. I’ve been asked if this bread can be made with 100% whole wheat. Here’s my answer, “NO“. While it can be done, you will be sacrificing so much in the taste and texture departments. Truly the white flour makes all the difference. This isn’t sandwich bread. We don’t consume this crusty bread every day. It’s a treat and homemade treats are meant to be enjoyed and savored. A treat that’s made in our kitchen, by our hands, creating a love for fresh, scratch cooking. And a family tradition and culture of made-with-love food. If you don’t agree, it’s okay. I’ll be back to posting soaked, sprouted, and all sorts of other goodness later. So sit tight while I tend to some delicious white, crusty goodness. With that said, this bread is one that cultivates a culture of tradition in my kitchen. The earthiness of this bread, the time spent preparing it, and the nourishing soups and big salads we enjoy it with will forever be etched in my children’s memories. Mix: In a large bowl or your Kitchen-Aid Mixer, combine the flour, salt, and yeast. Whisk the ingredients together. If you are using any herbs (or any other additions) add them to the flour mixture and whisk. Now, add the water. With the dough hook or a trusty wooden spoon, mix all the ingredients together until the dough is wet and sticky. 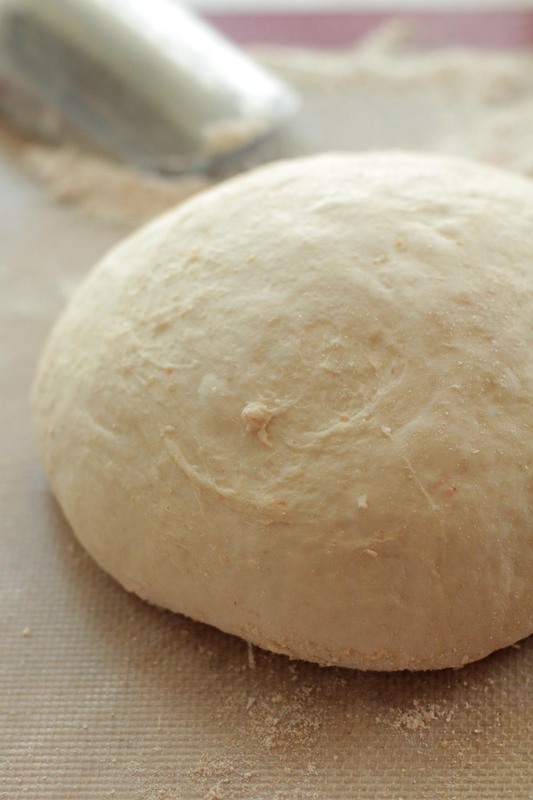 You are not looking for a perfectly formed ball of dough. Wet and sticky are the key words. Cover your dough with a towel and let sit for 12-18 hours on the counter. Form: After 12 hours, preheat the oven to 450°. Once the oven is heated place your dutch oven in the nice, hot oven and allow it to sit for 30 minutes. While you are waiting remove the towel and scoop the dough onto a floured surface. Form the dough into a ball, cover it with a towel, and allow to rise while the dutch oven gets nice and toasty. I often double this recipe to share with neighbors or a friend. It really pays off to be the neighbor of a real foodie, urban homesteader. Free fresh eggs, fresh herbs and veggies, and fresh bread. Bake: Once the dutch oven is toasty and steamy (30 minutes), carefully remove the top and place your bread in the pot. Place the top back on and close the oven door. Crusty, bakery bread is about to happen! Cook the loaf for 30 minutes, covered. After 30 minutes, remove the top and allow to cook uncovered for 15 minutes. I use a Kitchen-Aid Mixer fitted with the bread hook attachment to make this bread, however, you don’t need one. 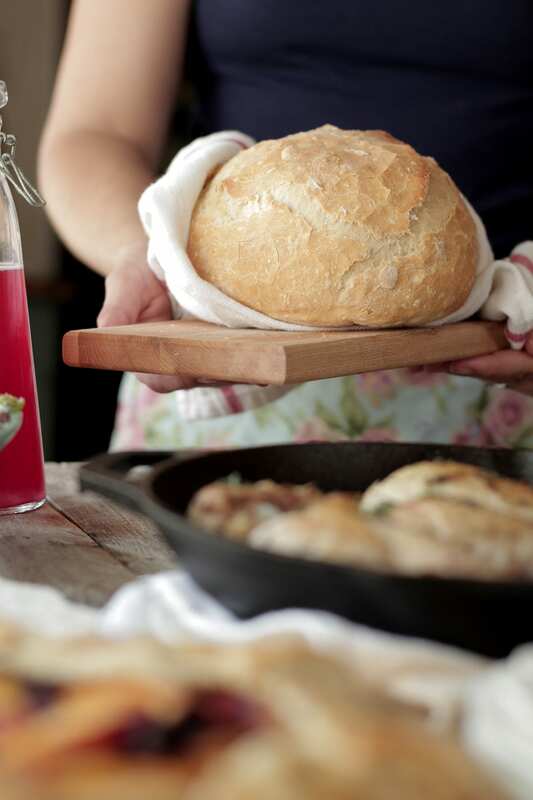 You can simply use a wooden spoon and your bread will still come out just as perfect! The result? 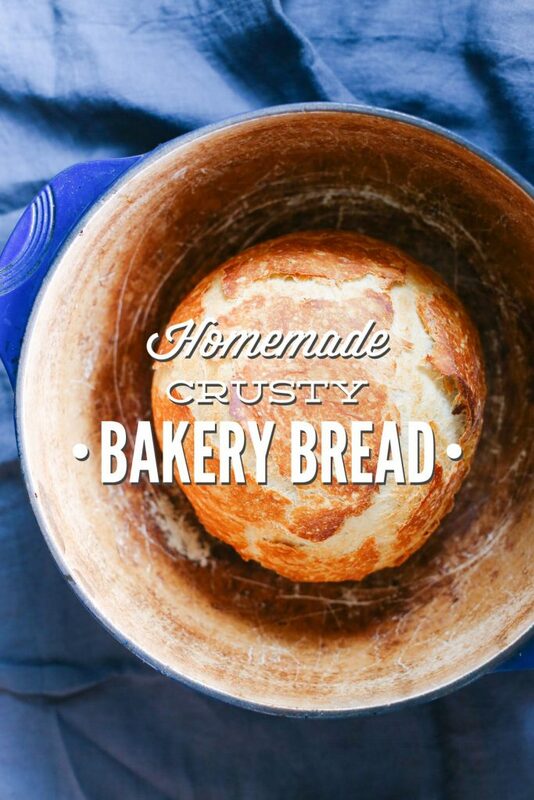 Crusty on the outside and soft on the inside, homemade bakery-like bread. This bread is perfect to serve with a big bowl of fall soup, a big salad, hollowed out as a soup/bread bowl, or smothered with freshly whipped garlic-herb butter. Later this week I will be sharing my favorite whipped garlic-herb butter. The perfect accompaniment to this rustic, fresh bread. Kristen, thanks so much for posting this wonderful bread recipe. I, like you, do my best to keep my food whole, non-processed and organic. Sometimes it’s nice though to have something like this wonderful bread – reminds me of the bread that my Grandmother used to make every week. I’m going to make some to eat with the homemade butter I made a couple of weeks ago with the instructions you guys posted. Blessings. Thank you, Jonnie. I love that it reminds you of the bread your Grandmother used to make. That’s the wonderful culture and tradition of food I just love to hear about! This bread really is so delicious. Can’t wait for you to try it and the homemade butter will be so perfect on a big warm slice. Are you sure it’s only 1/2 TEASPOON yeast?? In any bread making I’ve done, that does not seem like the right ratio to the rest of the ingredients? Hey Valerie, Yes, 1/2 teaspoon :). I know, it seems a bit off, but it works. You’re welcome to increase the yeast to 1 teaspoon if you’d like. This bread looks amazing. It will go perfect with the soup I am planning for tomorrow. However, I do not have a ditch oven. Do you think it would work ok in an oven proof sauce pan or stockpot? A stockpot would work perfectly! I’ve used my stockpot to make this bread many time. hi, I only have spelt (dinkel) flour. Could I use that? Is the dough after that long a rise not even more wet then before? Or do you flour just the outside to form a ball and the inside stays as wet? Hi Vera, You can try spelt flour. It might be a bit dense (like whole wheat), but it will probably still be delicious. After the first rise the dough is wet and very sticky, although easier to handle than when it was first mixed together. It will easily form into a ball and you can use a floured surface and hands if you need. That’s the correct pot. Any Dutch Oven type pot will work beautifully. I love this bread. I have a very similar recipe I have been making for the past couple of years, and made the same way. I bake mine in an old cast iron dutch that belonged to my mamaw. 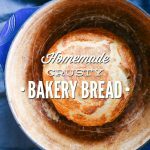 Probably one of the most versatile and simplest bread recipes I have ever come across in 20 + years. Good stuff! Thank you, Tina, for sharing. It really is so delicious! I love the tradition you have behind making yours using your cast iron dutch oven from your mamaw! I am asking every foodie I run across if you know how to make sourdough bread with Coconut flour. Sorry I don’t. I don’t make much with coconut flour. At http://www.mydailysourdoughbread.com she makes sourdough bread with millet flour-so cool and she has a video. That’s awesome. I love following her account on IG–such gorgeous bread creations. Sometimes you just gotta enjoy a little crusty-bakery-bread! Mmmmm…..
Made the bread and filled it with sweet potato soup…they both turned out great! I made your bread. it came out beautiful. thanks for sharing. It’s ready and set, tomorrow morning I’ll be baking bread for the first time. I’m so exited!!! Yum! Nothing like warm, fresh bread. I’ve made this bread many times with whole wheat and spelt. Both work amazingly well. Still just as tasty. I think letting it sit overnight makes it fluffy and light, no matter what the (gluten)flour. I don’t really like the texture of the wheat with this loaf, but it’s certainly doable. Glad to hear you like it that way. It’s a favorite in our house. Sounds yummy, Amber. It will probably bit a more dense, but still delicious. Do you think this could be done with a 4 qt dutch oven? Hey Kat, Definitely! I have a 3 qt, 4 qt, and 6 qt. I just tested out the 3 and 4 last week (6 was dirty ;)) and the bread turned out perfectly! As long as the 4qt is a standard dutch oven, it should work perfectly. Hey Jenn, The crusty outside is achieved via steam in the Dutch Oven. I think you could place a baking dish with water on a bottom shelf of the oven and a hot baking stone on the shelf above and preheat the oven as you would for the Dutch Oven. Then, you would place the long bread on the hot baking stone and bake. I believe this will achieve a crusty bread similar to this recipe. Can I mix everything in the bread machine, then remove to follow cooking direction as noted herein? Thanks. Hey Natasha, I think that would work. Let me know how it goes. Hi, I have made this bread a couple of times and my family is loving fresh crusty loaves (since we usually only do whole grain breads) and it is pretty awesome to be able to bake something like this at home in my Le Crueset! My question is that about the shaping the dough into a smooth round ball step-exactly how am I suppose to do that? May sound silly but each time I have made the bread I’m pretty much baking a blob of dough that is not shaped into a ball at all because I’m not sure how to form it and worried I will ruin the texture of the bread if I overhandel it…and because of this my end result is just not as tall and round as it should be :(, I would really appreciate your advice, thank you! Hey Danya, No greasing is needed if you’re using a cast iron enamel Dutch Oven. I do have a question (and it may be a really dumb one since I’ve never really attempted bread before): no one else in my house eats white bread (weirdos, right??) but they do eat sourdough bread. Would it be possible to make this kind of bread as sourdough instead of white? Hey Chihiro, This recipe method will work great for sourdough. Here’s a good tutorial on how to use this method with sourdough: http://www.theclevercarrot.com/2014/01/sourdough-bread-a-beginners-guide/. Just took my loaf out of the oven and it looks and smells amazing! My only issue was how sticky the dough was in the morning when I tried to shape it on a Silpat to rise a little more. Is it supposed to be really sticky? I rolled it around and kneaded some extra flour into it so that I could work with it. Yum, Megan. Yes, that’s correct…the loaf will be sticky, but if it’s too sticky just knead in a bit flour into the dough until it’s more workable. I hope your bread was amazing!! I can’t wait to try this recipe! I have a question… (Sorry if this sounds a bit silly!) when you leave the dough to rise overnight, do you tuck the towel in around it or just lay it across the top of the bowl? Also, any tips on getting the dough into the pot after the second rise? Do you flip it in upside down or carefully place it? Thanks! I lightly drape the towel over the bowl just to cover it, but not block air from circulating. After the second rise I do my best to place my hand under the dough, sometimes shaping the dough a bit as I make my way to the hot oven and Dutch oven. It can be a bit tricky, but this dough and recipe are very forgiving. I just wanted to tell you thank you so much for this recipe!! I’ve been making bread for 5 years or so and love it, but, I’ve never found a white bread with a flavor as good as this one or a crust like this. This is magnificent!! Hubby said it was now his favorite bread that I’ve made……and it’s been a lot of bread thus far :-). I made it today, and it’s almost gone so I’ll start another batch or two tonight. We also made your garlic-herb butter to go with it – it, too is quite a find. Delicious!!! Thank you so much for sharing these recipes with us. P.S. This recipe worked just fine in my 5 quart Dutch oven. That’s awesome, Sarah! Enjoy the last couple of slices :). And thank you so much for sharing! What temp should the water be?? Rachael, Room temperature water :). Is there a way to make this recipe without having a dutch oven? Is there another dish which could be used? Maybe a corning ware dish? Hey Lindsey, I haven’t tried using another dish, but I heard from one reader that used a crock-pot (that was oven safe to 500F) successfully. Ok another question as I was reminded that I do have a dutch oven! It’s small though only a 2 or 2.5 qt. I saw your comment about 3 qt. 4 qt. and 6 qt. dutch ovens – do you think my 2 qt. will work or is it too small? Hey Lindsey, I think a 2 quart will be too small for this recipe. You could divide the dough into two small balls and then bake each of them separately in a 2 quart Dutch oven. Just wanted to say thanks! I tried this recipe a few months back and it’s become my go to accompaniment for special occasion meals- like today’s Easter pot roast! I always mix in a handful of fresh chopped rosemary that I grow on the windowsill- comes out perfect every time. I’m so happy to hear that, Stevie! Thank you so much for sharing. I cannot wait to make this tomorrow! Question, I only have a glass 2 quart casserole dish or a stainless Dutch oven…will one of those work? Hey Tami, I would go with the stainless Dutch oven…that’s what I used for a long time before I purchased my cast iron. It should work perfectly! I really like your views on bread. I, too, typically use 100% whole grains, and make a lot of sourdough things. But about once I year I make a good loaf of white bread! Now for my yearly loaf, I use white einkorn flour, which actually tastes even better, and I figure, is at least a little better for you. Thank you, Cristina! I love einkorn, too! Can I make a few batches and freeze the dough? Do I freeze it after the first rise, and when I take it out if the freezer how long should I let it sit? Thanks for your help. Hey Dianne, Yep, freezing the dough should work well with this recipe. I would freeze the dough after the first rise. Then take it out of the freezer and let it defrost overnight in the fridge. Then place the bread, covered, on the counter for a second rise, and bake. Hi. Your recipe looks so yummy and relatively simple. I’m a beginner bread maker so I have an unusual question. Doesn’t the bread dough get stuck to the teatowel if it’s not greased? Happened to me before and oh what a mess! Thanks. I would love to see a picture of the crumb, it looks lovely. I just made a very similar recipe that uses eikorn whole wheat and a half cup of sourdough starter instead of half a tsp of yeast. I’m just waiting for it to cool so I can cut into it. I like your method of baking better- more time with the lid on, less time with it off= lighter colored crust. I’m going to try this next time , thanks so much! Hey Bethany, I’ll try to make this loaf again in the next couple of weeks to get a crumb photo for the post. The photos in the post were updated a couple of years ago from the horrible photos we once had, lol. This was my first time making bread…and I’m not sure what I did but I clearly didn’t do it right. 🙁 The dough didn’t really rise either time. After it sat on the counter for about 17 hrs I tried to form it into a ball but it would just sink back down like a pancake. So I tried adding more flour in but it didn’t seem to help too much. After baking it was still pretty flat and the outside crust was hard and difficult to cut through. :/ Any ideas on what I did wrong? Hey Kristin, It sounds like maybe there was an issue with the yeast–it was either old or not active. I would try a different kind of yeast (active dry yeast). You could test a small amount of the yeast in a cup of water–sprinkle it over the water and after a few minutes it should start to foam. If this happens, the yeast is active and good to use. Could you make this in a bread machine…. Hey Beth, You probably could, but won’t get the same crusty results. I have made this wonderful bread with 1/2 unbleached all-purpose non-GMO flour & 1/2 Whole wheat non-GMO flour & it worked beautifully. I have also added herbs as well as cheese for a wonderful bead to serve with soup or stew.